Me: Where’s your kitty coat? Brontë: Oh… Well… Good. No monsters. Brontë has been very concerned about monsters lately. She is afraid of the dark, because according to her, monsters come out and eat her feet at night. We have tried giving her a night-light and putting glow-in-the-dark stars on her ceiling. She likes them, but still wants the light on. There are different schools of thought about how to handle the monster issue. Some people suggest helping your child look for monsters to reassure them the room is safe, while others think this reaction only reinforces the idea that monsters are real. They believe you should instead teach children that monsters don’t exist. My opinion is that monsters are such a deep part of a child’s psyche that you aren’t going to dislodge the notion by claiming they don’t exist. I think children might be even more worried if they believe their parents aren’t properly addressing the issue. There are far too many fairy tales involving trolls, witches, and monsters for us to underestimate the importance of monsters in a child’s imagination. Just think about how YOU feel when watching a horror movie or thriller. Even though you know this is a fictional movie, you still get nervous… and you are an ADULT. I don’t believe in ghosts, but I still wouldn’t want to spend the night at a haunted house. I may not rationally believe in the supernatural, but clearly some part of my brain still does. For a child, the line between fantasy and reality is even fuzzier. With this in mind, I have started doing nightly monster checks in Brontë’s room. I look under her bed, announcing, “No monsters!” I look in each drawer… No monsters! In the closet… No monsters! She seems to find this extremely reassuring and has started making the rounds with me. She grabs her little pink flashlight and shines it under the bed, in the closet, and in every nook and cranny of her room, confirming “No monsters!” each time I say it. After hearing about this ritual, my aunt made Brontë some “Monsters-B-Gone” spray. 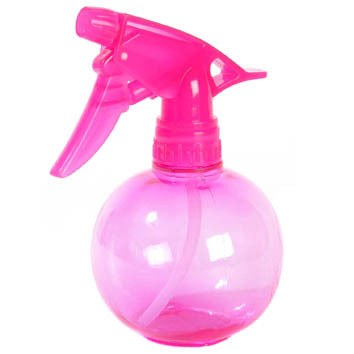 It’s an essential oil mixture in a pink spray bottle that Brontë can spray into any suspicious corners of her room to keep monsters out of them. She seems to enjoy it and it smells nice. “Monsters!” she announced knowingly, thrusting her index finger in the air.